Javier Fernandez admits he's not a huge fan of chess. "I'm not very good either," he says. Nevertheless, his queen, king, rook and knight are attracting a lot of attention. 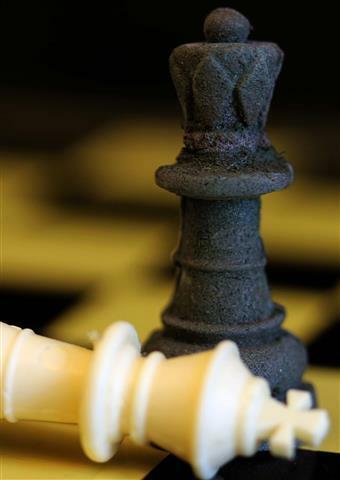 The black and white chess pieces are made of plastic, but not the petroleum-based kind experts warn may be laden with hormone-scrambling chemicals. Rather, Fernandez and his colleagues molded the complex game pieces from a compostable material abundant in nature: Chitin. It's the stuff of shrimp shells, insect armor and butterfly wings -- and now of a small collection of chess pieces, party cups and egg cartons in a Cambridge, Mass., lab. "It's so cheap and abundant," said Fernandez, a postdoctoral fellow at Harvard University's Wyss Institute for Biologically Inspired Engineering and co-author of a study on the material published in late February. "Besides vertebrates and plants, it's in almost every other living thing on Earth." Meanwhile, leftovers from fossil fuel refining continue to be used to build everything from chip clips and cell phones, to children's toys and sippy cups. Evidence suggests the chemicals that give these plastic products their characteristic hardiness or flexibility, such as phthalates and bisphenol A, can pose nasty consequences for human health. Although still hotly debated, most studies of BPA, for example, find that it may mimic or block the body's hormone messengers responsible for such critical processes as metabolism, growth and reproduction. As a result of rising concerns, BPA-free products have flooded the market. But scientists now suspect that some BPA replacements may be just as harmful . Last week, Mother Jones exposed an apparent plastics industry campaign to bury such findings. "We're using plastics in so many ways that we don't even think about them anymore," said Laura Vandenberg, a hormone disruptor researcher at the University of Massachusetts, Amherst. "We still need these products. But the point was never to ban one chemical and replace it with another that has the exact same properties." The new chitin-based bioplastic, Vandenberg said, "holds tremendous promise." Public health concerns with petroleum-based plastics extend beyond users, to their production and disposal, said Fernandez. Toxic chemicals spew from polyvinyl chloride plants, for example. Plastic waste accumulates in oceans and breaks down into tiny bits, which can concentrate toxic pollutants and travel up the marine food chain. "Most of our material is coming from marine animals themselves," said Fernandez of the chitin-based plastic. "Once it is discarded, it degrades very easily -- especially at sea." The material is compostable, and can be used as fertilizer. In their new research paper, Fernandez and his colleague, Dr. Donald Ingber, describe a new way to process chitosan, a form of chitin, making it potentially viable for large-scale manufacturing with traditional casting or injection molding techniques. "Pretty much anything you can mold, you can make out of this stuff," said Ingber, founding director of the Wyss Institute and a professor at Harvard Medical School and Boston Children's Hospital. While "potentially toxic additives" are needed to alter the properties of conventional plastics, Ingber noted that plasticizers are not required in their material. Rather, they enlist natural ingredients such as water and wood flour, a waste product from wood processing, to optimize the material's shape, strength, resilience or flexibility. For certain products, such as the red, green and blue party cups Ingber and Fernandez created in their lab, recyclable dyes and wax coatings are added. The prototype cups, they noted, are about as strong as a typical store-bought cup or bottle. Of course, several challenges remain before the 10 billion tons of chitin produced by living organisms annually could have a chance of becoming a game-changer for the $375-billion-a-year plastics industry. "It all comes down to cost," noted Ingber. "Whatever you come up with in the lab needs to be scaled up." Ingber and Fernandez said they have obtained a number of patents, and are beginning to attract interest from companies seeking to reduce their carbon footprint. Two of the largest manufacturers of consumer goods, Procter & Gamble and Unilever, declined HuffPost requests for comment. James Berge, principal and director for science and technology at HOK, a global design, architecture, engineering and planning firm, said the new material so far appears "a cost-effective stable material." "The ability to injection mold and cast the material with existing manufacturing technologies is a big first hurdle and fundamental for manufacturing feasibility," Berge said. While optimistic, Amherst's Vandenberg added an important caution: "Just because something is natural doesn't mean safe," she said. "There is arsenic in well water." Joel Tickner, an expert in green chemistry at the University of Massachusetts, Lowell, pointed out that new plastics -- even those made of chitin -- must undergo testing "to ensure they are really better, and safer." The Food and Drug Administration said its approval is required for any new chitosan-based product that may contact food. The Environmental Protection Agency requires notification for manufacturing of other chitosan-derived materials. "Chitin/chitosan offers a renewable, biobased feedstock alternative to traditional petroleum-based synthetics," the EPA said in a statement to HuffPost, noting that the Presidential Green Chemistry Challenge Awards Program has received nominations for chitin-based technologies. Many plant-based bioplastics also show potential to revolutionize the plastics industry, noted Tickner. He highlighted the efforts of NatureWorks, which is turning sugar derived from corn and other crops into a material now employed on a small scale to make clothing, water bottles and other consumer products. Ingber and Fernandez said their bioplastic has benefits over other plant-based versions. It doesn't compete with land or other resources for basic human needs. Most of the available chitin comes from shrimp, which discard their shells every month or two. Seafood processing alone creates about 150,000 tons of usable chitosan every year. "The plastic problem is so huge and so bad that we have to explore all options," Ingber said. "This is an exciting one."